Any regular reader will know that I’m a big fan of s’mores in any form you can imagine them in. The S’mores Frappuccino, as you might suspect, is a treat that is on my “to drink” list during the summer. The frappuccino – for those of who haven’t had it – actually uses a toasted graham cracker syrup to capture the flavor of graham crackers, then adds marshmallow-infused whipped cream and chocolate sauce. Since I find a lot of chocolate syrups (and things that claim to be “s’mores flavored” as a whole) to taste very artificial, I think that using real chocolate and pairing it with a graham cracker syrup is what makes the drink so successful. But the drink is only available in the summer and I like my s’mores year round. 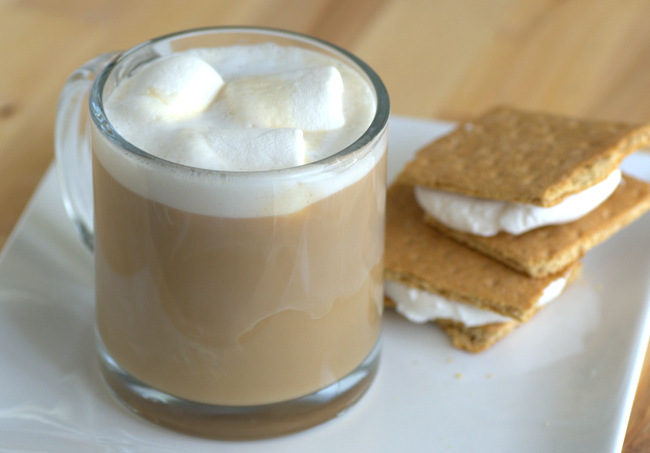 Fortunately, you can make a s’mores latte at home quite easily – even without the help of toasted graham cracker syrup. This homemade latte was inspired when I noticed that Starbucks was selling Toasted Graham K Cups in grocery stores. This flavored coffee is fairly mild, but it has distinct notes of toasted graham crackers, with a bit of honey and cinnamon (but not sweetness, as it is a black coffee) in every sip. I was surprised by how successful the k-cups were in capturing that toasted graham flavor and I used them to make a s’mores latte. First, I brewed a short cup of the coffee to concentrate its flavor. Then, I added some sugar to the coffee and a drizzle of hot fudge sauce to the glass. I didn’t fully stir in the chocolate sauce because I didn’t want it to over power the graham flavor. This way, it melts in the bottom of the glass and comes up slowly as you sip. The drink is topped with steamed milk and a few marshmallows. Feel free to toast the ‘mallows slightly with a kitchen torch before adding them for an authentic campfire touch. 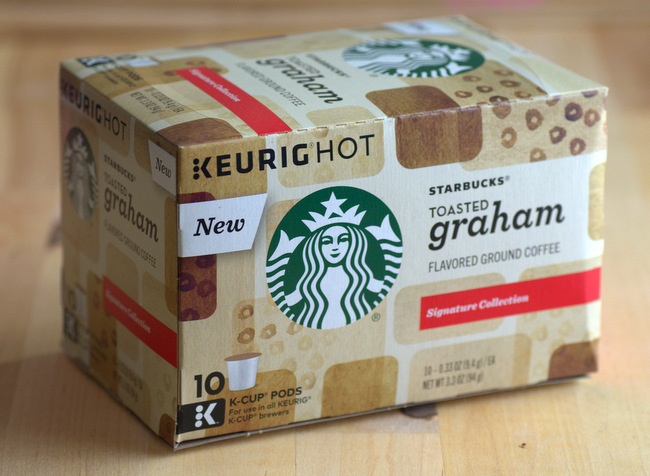 If you don’t have the toasted graham k-cups – don’t worry! You can make this without flavored coffee, too, though the method is slightly different. To capture the graham cracker flavor without flavored coffee or syrups, you’re going to have to infuse your milk with some real graham crackers by soaking the crackers in milk and then straining them out. This step takes a little bit of time, but the infusion will pull the flavor out of the crackers just like it does in cereal milk ice cream. Both recipe variations are included below. Place graham crackers in a small bowl with milk. Allow to infuse in the refrigerator for about 30 minutes. Strain out graham crackers. A small amount of milk may be lost, which is ok. Combine coffee and sugar in a large mug. Stir to dissolve sugar. Drop chocolate fudge sauce into the mug and allow it to melt, but do not mix in. Heat milk in the microwave and froth with a small whisk (or steam, if you have a steamer). Pour on top of sweetened coffee. Top with marshmallows and serve. This. Is Genius. Infusing milk with graham crackers?? Definitely trying this, thanks!